Google's Mother's Day doodle is cute and cuddly, a contrast to the story behind the holiday as explained on a link provided through the Internet search leader's homepage. Unlike some of Google's doodles that are static art, this one is animated. 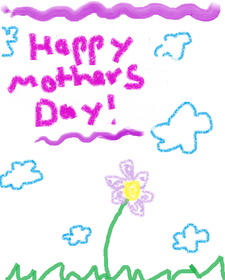 If you hover your pointer over the doodle, you'll see the message "Happy Mother's Day!" and if you click on it Google takes you to a search results page for the holiday. From there, you can learn from Wikipedia the fascinating story of how Mother's Day began and how it actually led to misery for its founder. Apparently, a woman named Ann Jarvis had founded Mother's Day Work Clubs in several cities that did altruistic things such as improve sanitation and treat, feed, and clothe Union and Confederate soldiers. After her death, her daughter, Anna, held a memorial for Ann and worked to make Mother's Day a nationally recognized holiday, which eventually happened in 1914. But get this: Anna soon turned bitter because the holiday became commercialized and people started sending their mothers printed cards -- a legacy that is still prominent in American culture today even in the electronic age. "A printed card means nothing except that you are too lazy to write to the woman who has done more for you than anyone in the world. And candy! You take a box to Mother -- and then eat most of it yourself. A pretty sentiment,” quotes her Wikipedia page, which also points out that the soured woman was never married or had children and was once arrested for disturbing the peace. In the end, she died in poverty. Good grief -- who knew Mother's Day had such a dark history? And imagine how appalled Anna would be to know today we can e-mail our mothers and quickly send them gift card balances over the Internet, with not as much as a scribbled signature required. In comparison, a printed card arriving via snail mail now looks downright thoughtful. It just goes to show that in addition to enticing Web users to stop by its online properties, these doodles are often very enlightening. As a mother, I'm not with Anna on this one. I fully appreciate the commercialization of this day and very much hope my family buys me all sorts of leafy gifts for my garden, so enjoy the day. Google's latest doodle is in line with that sentiment. At first you'll see the fourth symbol of the company’s name -- the lowercase g -- wearing pearls and looking as motherly as a letter can. A large door slowly opens, two "kids" -- the Os in Google's name, one colored red and holding a flower and the other yellow -- peek around then run out and jump into their mom's arms (yes, these letters have appendages). She takes the gift, sets the children down and the other letters in Google's name show up in gray, just so you don't forget what site you're at. (Also see "The Most Entertaining Google Doodles. ").